Usually, pink is not a color associated with men; it’s more likely associated with Paris Hilton or with Legally Blonde movie. 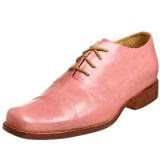 To my surprise, Esquivel shoe manufacturer has created a pair of pink oxfords for gents. I’m a bit confused why would someone wear them to a high class event – except some artist – but I have to admit they have a flawless design. The shoes are hand-crafted in US so, in case you dare to buy them, you help some American craftsmen keep their jobs.